The big Prius. Don’t worry. For better or worse, it’s still a Prius. 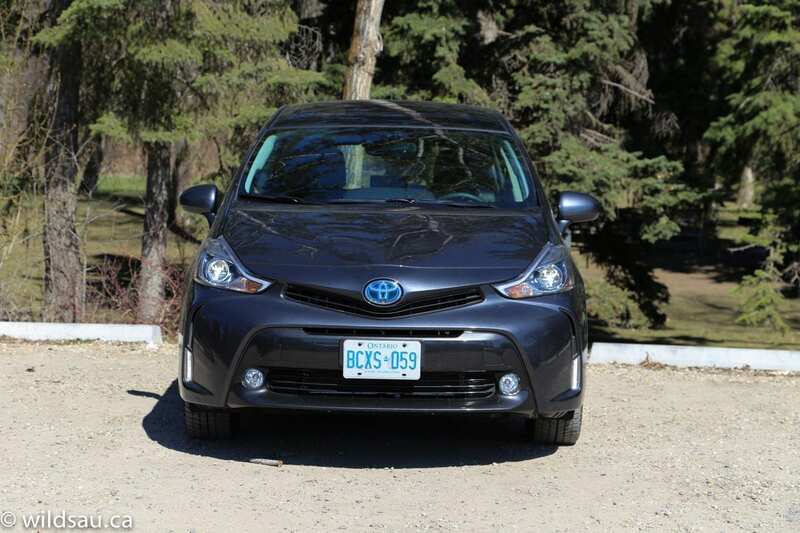 Toyota has put a little work into the 2015 Prius V. The most noticeable effort went into the redesigned front end. It now looks more aggressive. 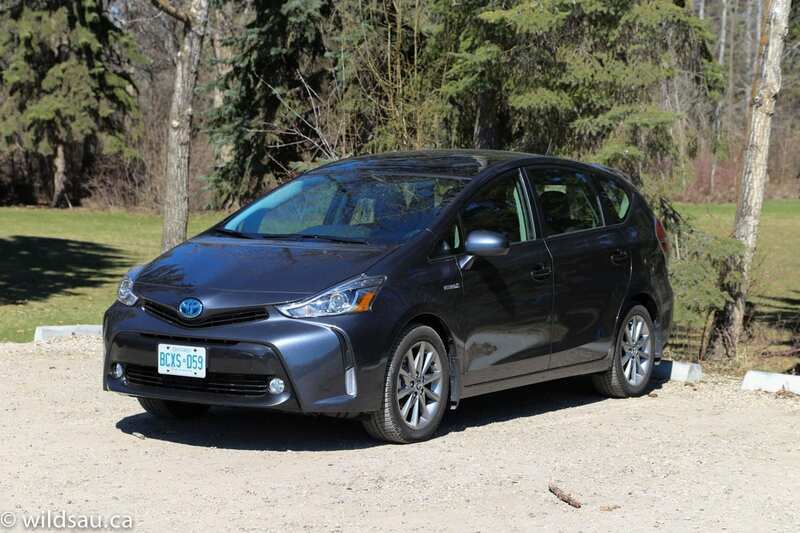 That sounds ridiculous for a Prius but it happened in a good way, and it includes Toyota’s new fu-manchu style that also found it’s way to the Yaris grille. 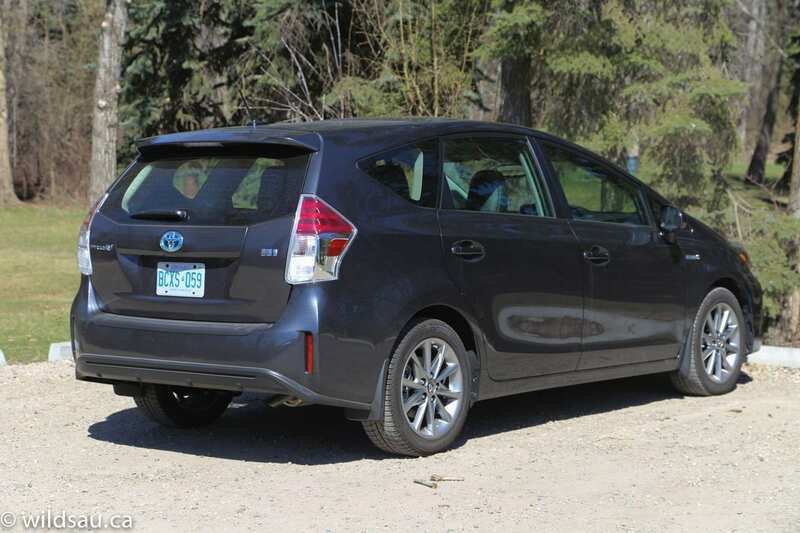 Otherwise the shape remains the same – it’s a longer, taller tail on a Prius which, in my opinion, makes it look a bit ungainly from some angles. But I’m a wagon kind of guy, so the overall profile suits me just fine. Function before form. 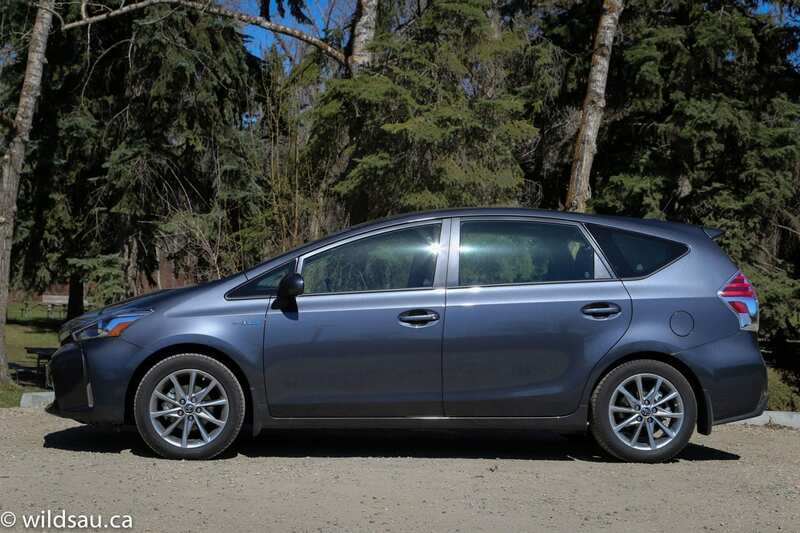 This upscale version comes with big-for-a-Prius 215/50-sized tires on a set of very nice 17″ aluminum alloy wheels. There are a few changes inside as well, including some new soft-touch materials, but again, the bulk of the interior will look familiar. 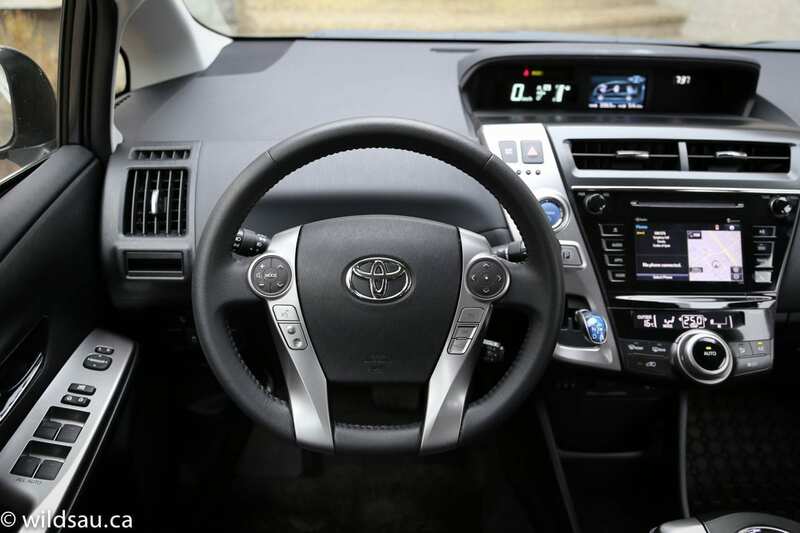 You get keyless entry and a push-button start, and you’ll find all your driving-related information under the eyebrow in the centre of the dash – a digital speedometer, fuel gauge and a very crisp and bright display with a ton of different information screens for you to scroll through. The SofTex-trimmed (read: vinyl) seats are heated and the driver’s seat is power-adjustable. I found them quite comfortable but a bit slippery and lacking in bolstering. That’s not the end of the world, because as you’ll see, it’s unlikely you’ll be taking this thing to the track and slinging it violently into corners. 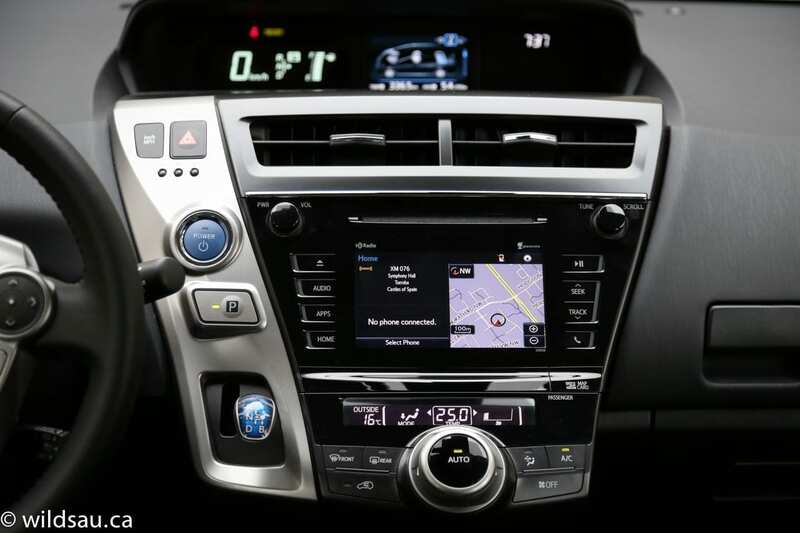 Below the upper display area is a chin that juts out – smack dab in the middle of it is where you’ll find a responsive 6.1-inch touch-screen system that looks after your navigation, phone and media systems as well as the automatic climate controls. It’s laid out pretty well and the user interface is decent. Overhead is a huge dual-pane panoramic sunroof (made out of resin to save some weight!) with a powered sunshade (that mysteriously kept closing itself when I got out of the vehicle – I’m sure there’s a good energy-related explanation for that). 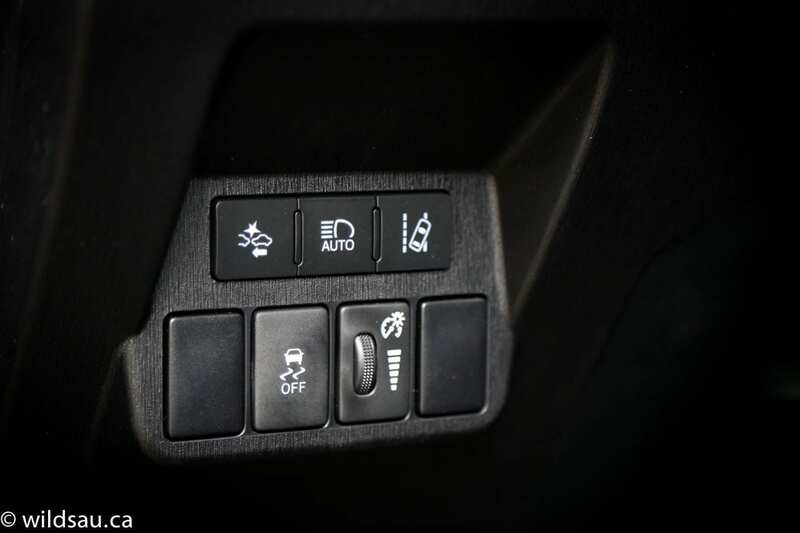 Driver assistance technology comes in the form of a pre-collision system, dynamic radar cruise control, lane departure alert and a back-up camera. Getting into the back is very easy thanks to a large door opening, and once in, you’ll find that you sit higher in the back which affords a nice view of the road ahead. Not only that, but the seats are comfortable. They’re also fully adjustable and highly flexible, sliding fore and aft and reclining. And the area is spacious with plenty of leg and head room. 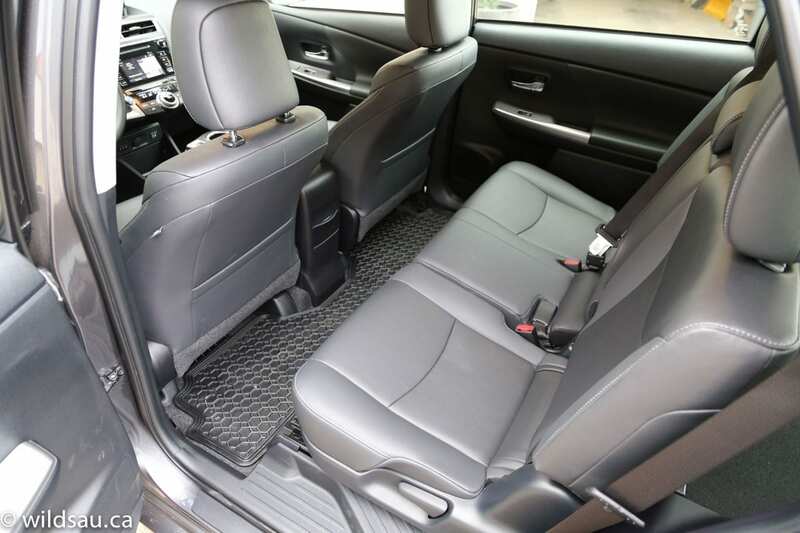 You get three wide seats and even the middle seat is adult-sized – add to that a totally flat floor and you end up with a very usable rear passenger compartment. 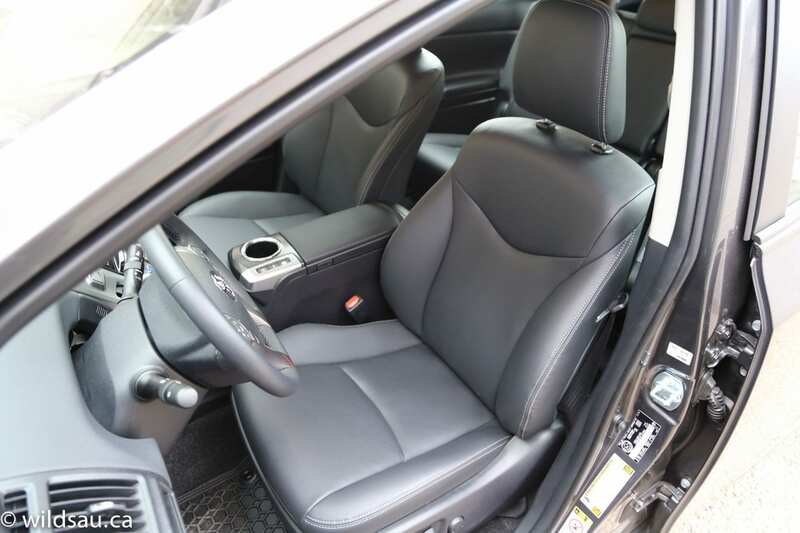 A dual cupholder folds out of the back of the centre console and a nice high armrest folds out of the centre seatback. Our three kids had a ton of space back there and if you have little ones, there are two sets of LATCH anchors for their seats. 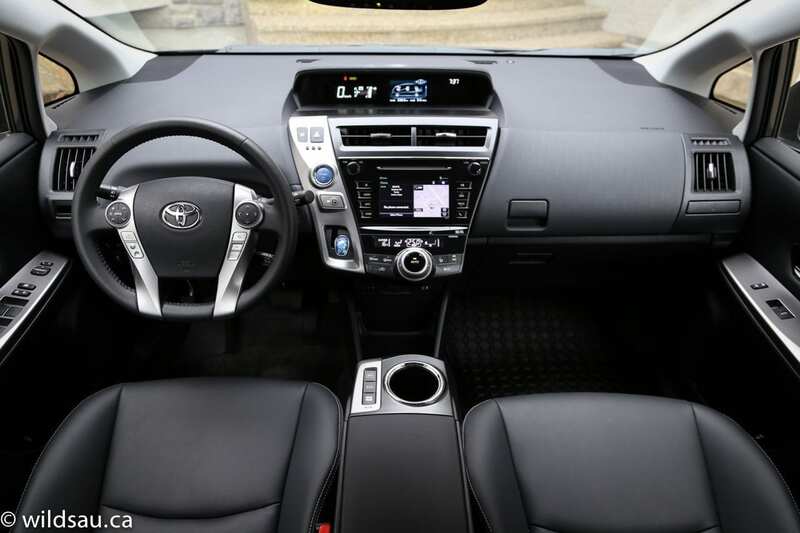 You will find tons of storage space around the Prius V cabin. I liked the large open space on the floor (under the “chin”) which includes a carpeted bin and a drop-in slot – this is also where you’ll find a 12V plug and the USB and auxiliary connections. The cavernous bin under the armrest lid is big enough to swallow larger items. 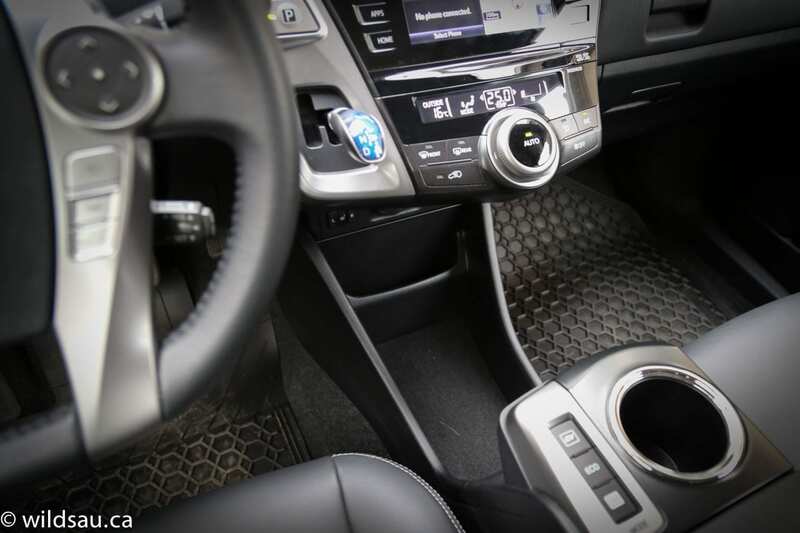 And that armrest lid is now upholstered in a nice faux leather instead of the strange black fabric Toyota use to use here. That will make it much easier to keep this surface clean. The obvious advantage over the regular-sized Prius shows up when you make your way to the back of the car. The huge 971 litre trunk is easy to access, thanks to a high load floor. Toyota has also seen fit to add quite a bit of underfloor storage – including a place to store the retractable, removable tonneau cover – I love that! 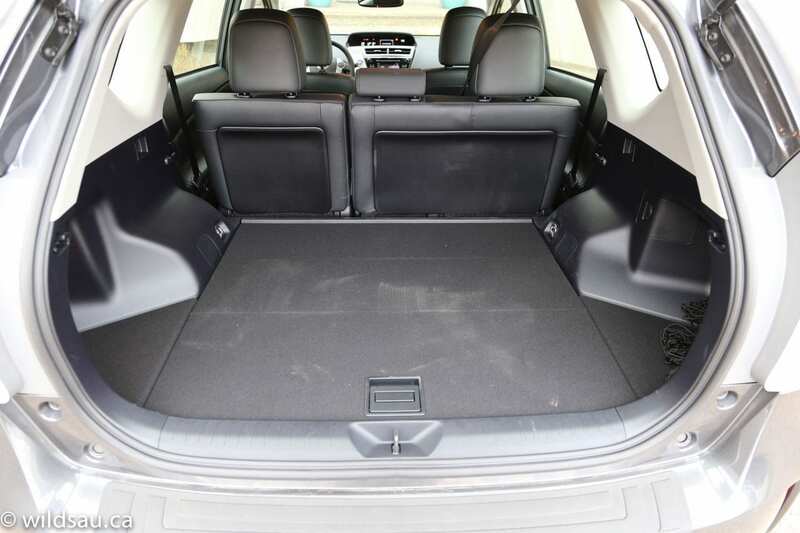 If you need more room, you can fold the rear seats down (in a 60/40 split) to access 1906 litres which moves squarely into SUV territory. There’s nothing new here – the 1.8-litre 4-cylinder engine paired with an electric motor for a net system horsepower rating of 136 is the same that we’ve seen for quite a while now. 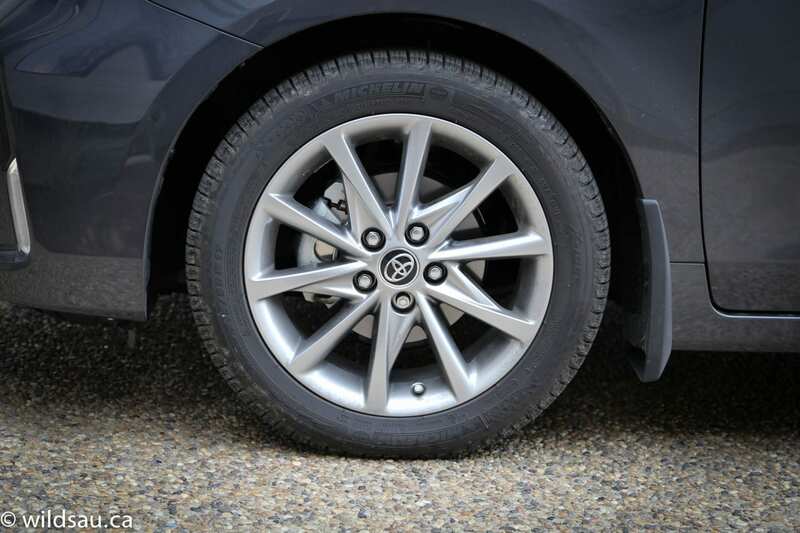 The front-wheel drive car’s power is routed through a CVT (continuously-variable transmission). 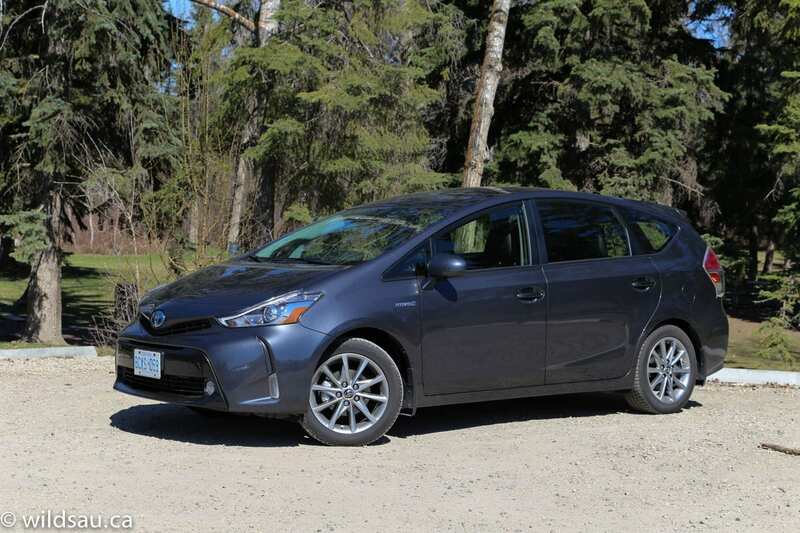 You don’t shop for a Prius unless fuel economy is of utmost importance so here you have it – the Prius V is rated at 5.4 L/100 km (43 US mpg) in the city and 5.8 L/100 km (41 US mpg) on the highway. We averaged 5.3 L/100 km (44 US mpg) which is pretty freaking amazing fuel economy. Even with the little 45 litre tank, the theoretical range for road trips is 775 kms. 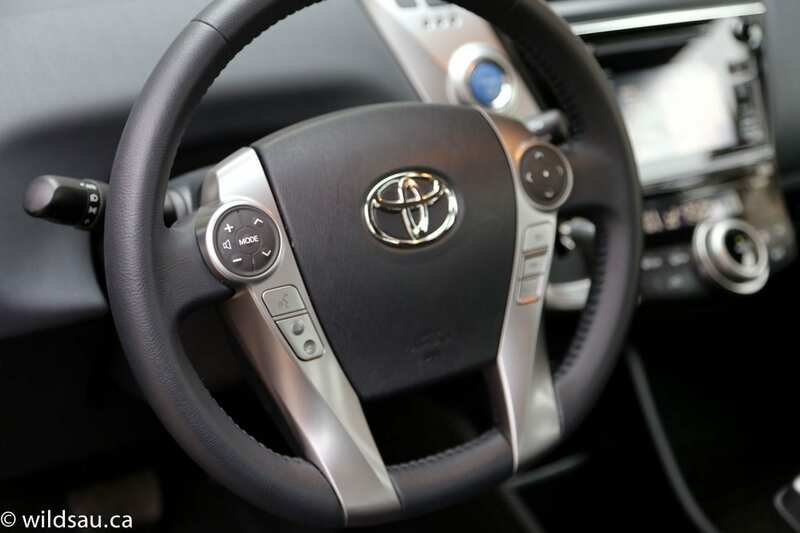 Snick the Prius into Drive – yes, you’re still using the strange combination of a joystick-like gear selector and a Park button to do these things – and you’ll invariably be rolling off the line on electric power. 136 net horsepower, no matter how you arrive at it, isn’t a lot when it comes to dragging a 3340 pound (1505 kg) wagon around. While you’ll never really get into trouble unless you’re trying to pull into fast-moving traffic, the driving experience is nevertheless one that feels underpowered. Unless you put it in Power mode, in which case things improve somewhat – but then you’ll hear the gas engine straining itself constantly, as if it’s pleading for mercy from you, the suddenly unrepentant gas-guzzling driver. And yes, you’ll chew through the battery reserves much more quickly in Power mode, which means you won’t be getting mileage that’s quite as impressive. 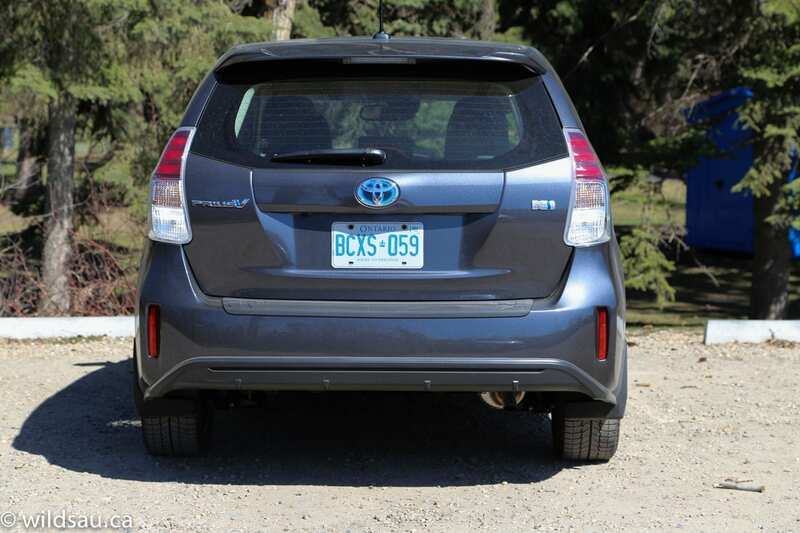 And let’s be honest – even in Power mode, the Prius V still works hard to get up to speed. The wagon’s handling is not that great – plenty of body roll around corners and squealing low-resistance tires make for a pretty lame drive, and yes, the regenerative brakes are mushy. 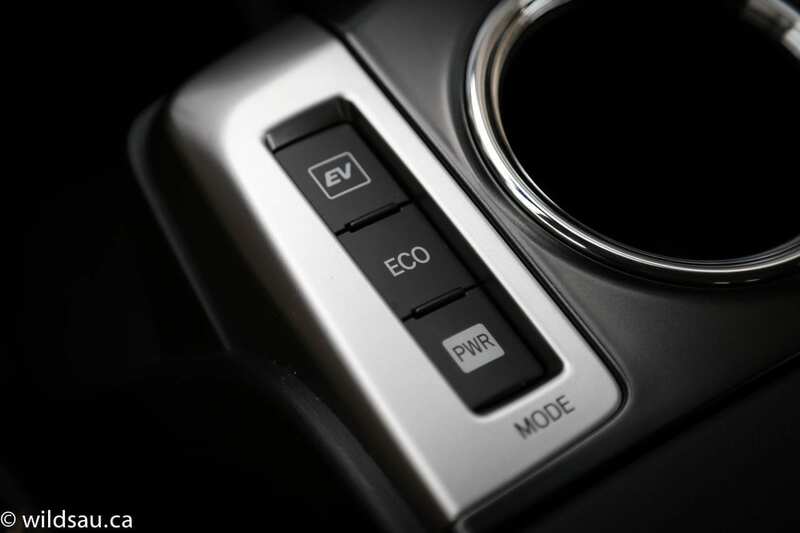 Aside from Normal and Power, you’ll find two other drive modes – Eco and EV (electric vehicle). 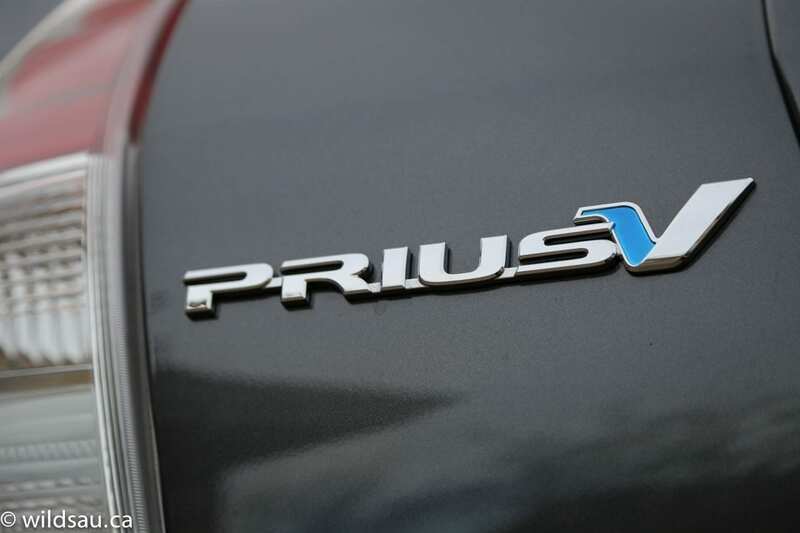 Eco really makes the Prius unresponsive and frankly, it becomes painful to drive. And EV only works if you’re moving around at a snail’s pace – so it would work in bumper-to-bumper commuting. Nothing exciting will ever happen while you’re driving the Prius V – unless you try to merge onto a freeway from a standstill. 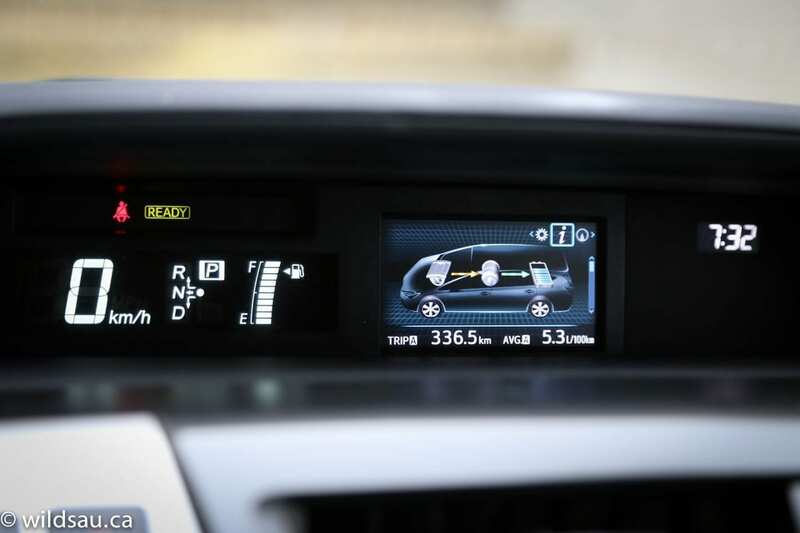 That will get your heart racing, as you start seeing traffic looming large in your rear-view mirror and you ponder the practicality of a vehicle that takes over 10 seconds to get to 100 km/h. 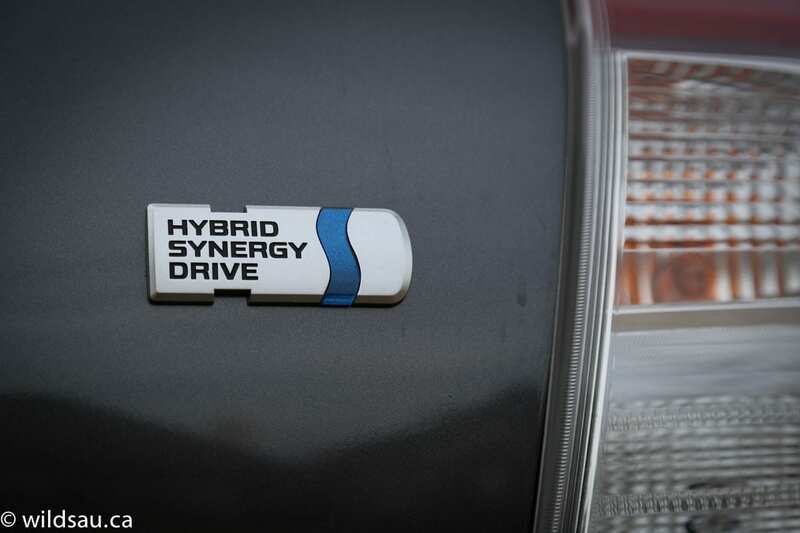 While the Prius does give something up in the driving experience, especially in V form, since it’s using the same engine to motivate a larger, heavier vehicle, it isn’t a horrible thing to drive. It is a vehicle that you drive economically, and driven that way, it’s satisfying enough to get you from point A to point B. And you can rest assured that you’ll have a very difficult time finding another vehicle that will get you this kind of fuel economy. WAF (Wife Acceptance Factor) was pretty high. 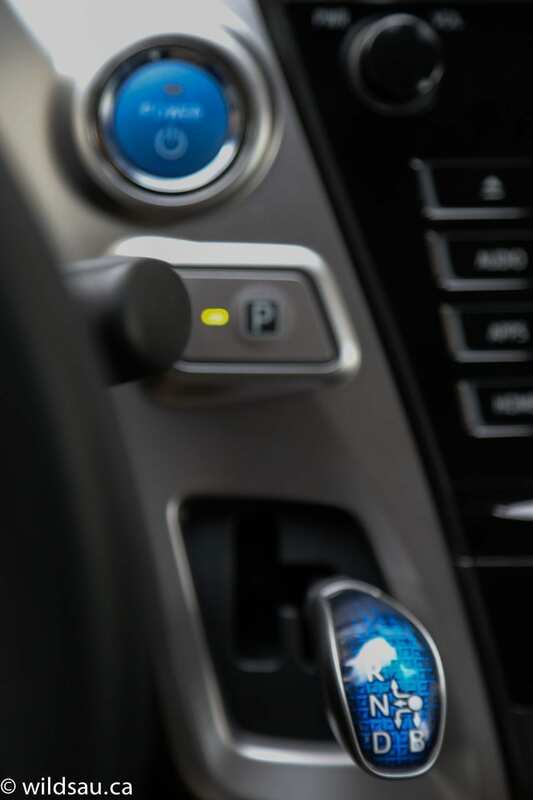 She thought it was a comfortable and easy-to-drive vehicle, but still hasn’t started liking the weird shifter thingie – a complaint she had with previously reviewed Priuses too. 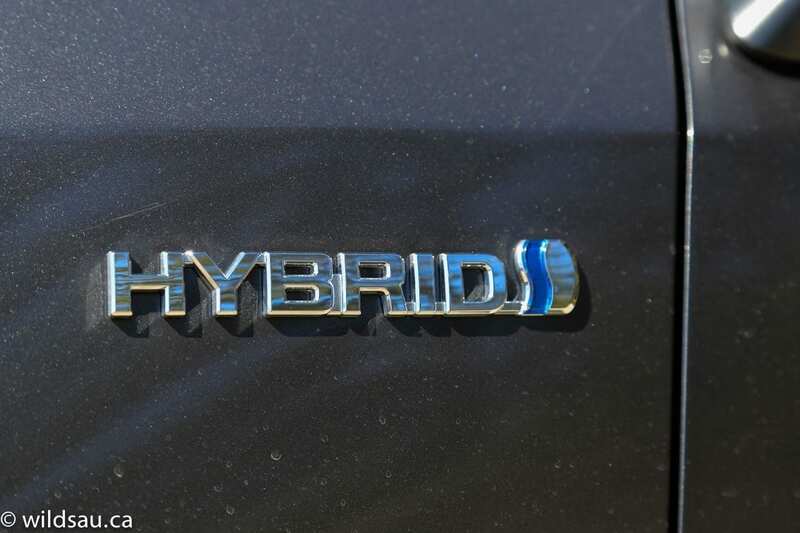 As I said earlier, you wouldn’t be shopping for a Prius unless maximum fuel efficiency was your thing. The driving experience likely matters less to you, or you’re willing to compromise there as long as you get this kind of mileage. 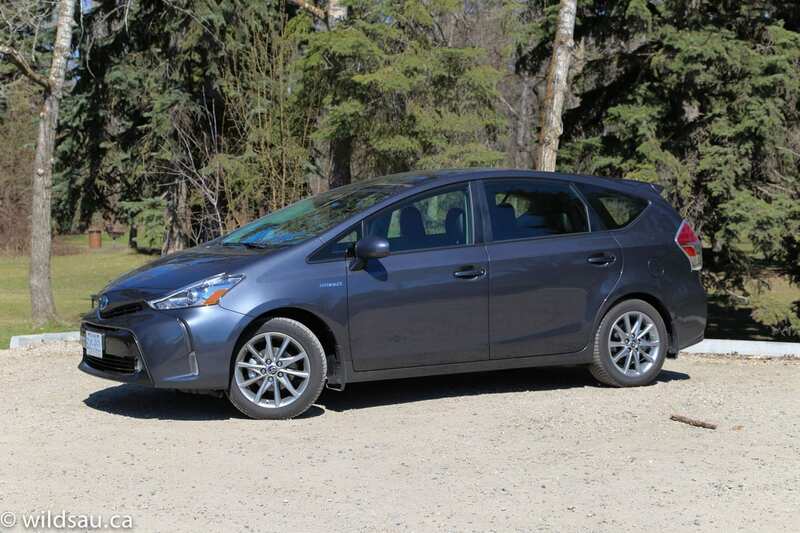 And if you need the additional space, the Prius V is the best choice of these hybrids. It’s certainly not for everyone, and in my opinion, you could get a small diesel vehicle which is more drivable and nearly as efficient, but that’s not everyone’s cup of tea either.